As with many great novels that take chances, Monsieur Houellebecq’s latest offering has been overshadowed by controversy, particularly when first published in France, his homeland. Submission was published on the day of the Charlie Hebdo murders in Paris, with the author appearing on its front cover as a wizardly caricature. Now beautifully translated by Lorin Stein, we can all share this near-future vision of France under Sharia law. Described variously as Islamophobic, misogynistic, and downright divisive, it is nonetheless a wonderfully well-written book with copious smatterings of dark humor. Our protagonist and narrator, Francois, is a middle-aged professor at the Sorbonne, who cleared the academic bar as a youth but remained forever stuck in the sandpit where he landed. A scholar of the 19th century French writer J. K. Huysman, he cannot—will not—pull himself out of his own mire of suicidal thoughts as he listens to Nick Drake, sleeps with his students, and (perhaps worst of all in the country of haut cuisine) eats microwave meals. In common with the policy for all educational establishments, Francois loses his job at the university as he is not a Muslim. So do all women tutors regardless of their religion. We begin to sense parallels between Francois’ musings and Huysman’s “desperate desire to be part of a religion” as he begins to consider a positive side to Islam despite negatives such as the loss of such “small dreamy consolations” of studying the female form as women no longer wear dresses or skirts. He engages in a clumsy, expositional conversation with a former secret service agent, and however much is explained to the reader, it is still a blunt device. While the narrative seems to be leading the reader toward Francois’ inevitable and passive capitulation, the tenses and phrasing employed provide a tantalizing “did he or didn’t he” to the ending. The choice is immaterial, it is the journey of the self-centered narrator toward that end that is not only entertaining but also prompts self-examination. After all, don’t the vast majority of voters opt for a candidate who best serves their own interests? And Francois is acutely aware of the ability of Islam to serve his own male interests. This book raises many questions not least about he politicizing of the family’s role in society, using this to justify subjugation. It casts women in a submissive and often degrading role. At times it is infuriating and disgusting. But he is also shining a bright light into the darkest corners of the male narrator’s mind to reveal the self-serving cretin he has become. Yes it can be described as misogynistic, but Monsieur Houellebecq’s contempt is not aimed purely at women. 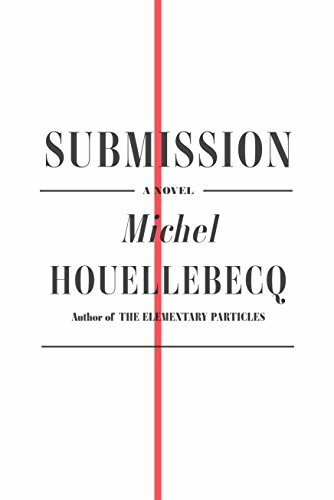 Monsieur Houellebecq is not cited as one of France’s greatest living writers without justification, and Submission is a grand entrance for the uninitiated to discover his thought provoking and masterful storytelling as well as his wicked, often self-deprecating sense of humor.